In the tradition of the Chicago Light Brigade’s annual artistic vigil for those who have fallen to violence in Chicago, community members led by the direct action collective Lifted Voices have used an artistic blockade to shut down a Chicago intersection. 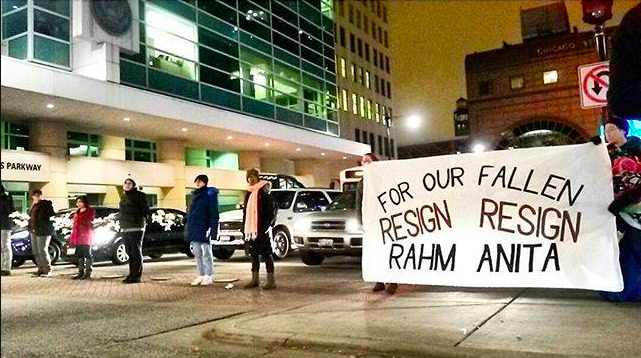 This protest is being carried out as a memorial to Chicago’s fallen and to demand the resignations of Mayor Rahm Emanuel and State’s Attorney Anita Alvarez. Sixteen community members are putting their bodies on the line to honor those we’ve lost and to demand that the officials who have been complicit in a culture of police impunity step down. Each blockader represents one of the shots fired at Laquan McDonald on the night he was murdered by CPD. The blockade includes a shining light for each person who fell to violence in Chicago this year – whose lives might not have been lost if officials addressed the root causes of violence in our communities, rather than embracing the ineffective, racist tactics of Chicago police. This action is being led by Indigenous and Black women who are members of the Lifted Voices direct action collective. UPDATE: All the Protestors are out. Please check out our campaign to free Naomi Freeman or to learn more about the Chicago Community Bond Fund, and sign up for our mailing list, visit chicagobond.org.